Both Apple and the FBI are taking extreme stances in the encryption debate, according to Peter Swire and Michael Vatis, who discussed the issue in a panel at the Cybersecurity for New America Conference on Wednesday. Those stances made picking a side in the debate far more complicated. Swire is a law and ethics professor at the Georgia Institute of Technology who has served as an adviser to both President Obama and President Clinton. Vatis is a partner at Steptoe and Johnson LLP and was the founding director of the National Infrastructure Protection Center at the FBI. “I don’t think either is right. I think both sides are being a little bit misleading,” Vatis said. Apple has challenged a Federal court order that would force it to unlock for the FBI the phone of one of the shooters in the Dec. 2 terrorist attack in San Bernardino, Calif.
Vatis noted that the FBI was incorrect in assuming that this case would only be applicable to a single phone, but that Apple was overestimating the danger inherent in complying with the FBI. Swire found taking sides a bit easier. “Apple has the better of it by far,” he said. Both agreed, however, that the issue of whom to support was far more complicated than it looked from the outside in both the tech industry and government agencies. Vatis pointed to Microsoft founder Bill Gates’ comments that seemed to vaguely support the FBI, saying that the industry was not as united as it looked. “Despite the tremendous outpouring of briefs in favor of Apple, behind closed doors in the industry, people are somewhat more mixed,” he said. Neither is the government totally in favor of the FBI, according to Swire. 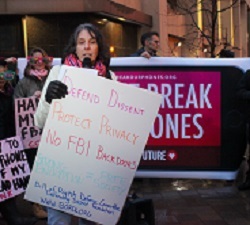 He noted that, for decades, government agencies have been divided on the issue of encryption. The Commerce Department nearly always votes in favor of stronger encryption. Law enforcement nearly always votes for greater access. And, like the independent in a race between conservatives and liberals, the Defense Department often acts as the swing vote in encryption debates. More recently, Defense has swung toward siding with Commerce. “It’s a group project, but the members haven’t all agreed yet,” Swire joked. Though both McSweeny and Swire seemed to be definitively in favor of Apple, Vatis was decidedly undecided and reserved judgment for when more facts could be brought forth by both sides. The panel itself was bookended by audience opinion polls on the matter. The poll at the beginning of the panel revealed that 63 percent opposed the court order against Apple. And it seems that Vatis’ indecision had little effect on the audience, as polls at the end of the panel showed 68 percent still opposing the court order.